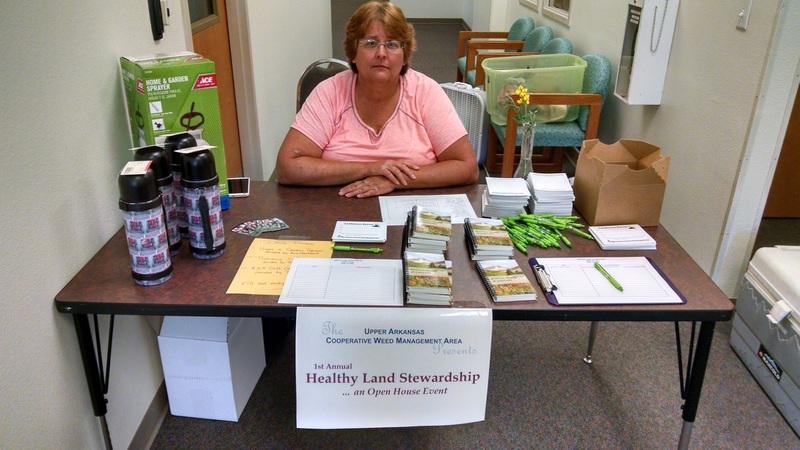 At the noxious weed table, the UACWMA was the only group discussing some of the potential negative aspects of noxious weeds, invasive species, and the connections to home gardens. Many of the people that stopped by the booth were surprised to learn about the noxious weed act and the threats to our local ecosystems. ​The UACWMA attended the Western Landscape Symposium on Saturday, March 30, 2019, in Pueblo. The event featured interesting topics and speakers, including gardening for native pollinators, seed collection and storage, xeriscaping, and more. The symposium was focused on providing resources and education to individuals that are active in gardening, landscaping, and land management. Those in attendance included horticultural plant producers, cacti specialists, interested homeowners, plant fanatics, and many agencies involved in gardening and plant production. At our station, UACWMA set up large, full color flower images with associated fact sheets. 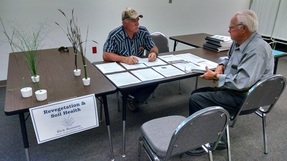 Additionally, the station provided copies of general information regarding weed management, including guides to weed life cycles and guides for weed management. In total, 27 species fact sheets were given away, with the greatest interest in Myrtle Spurge, and an additional 89 pieces of educational literature provided for the community. UACWMA gave copies of the GardenSmart guides from CWMA to key individuals active in the industry, including perennial producers and native seed collectors. 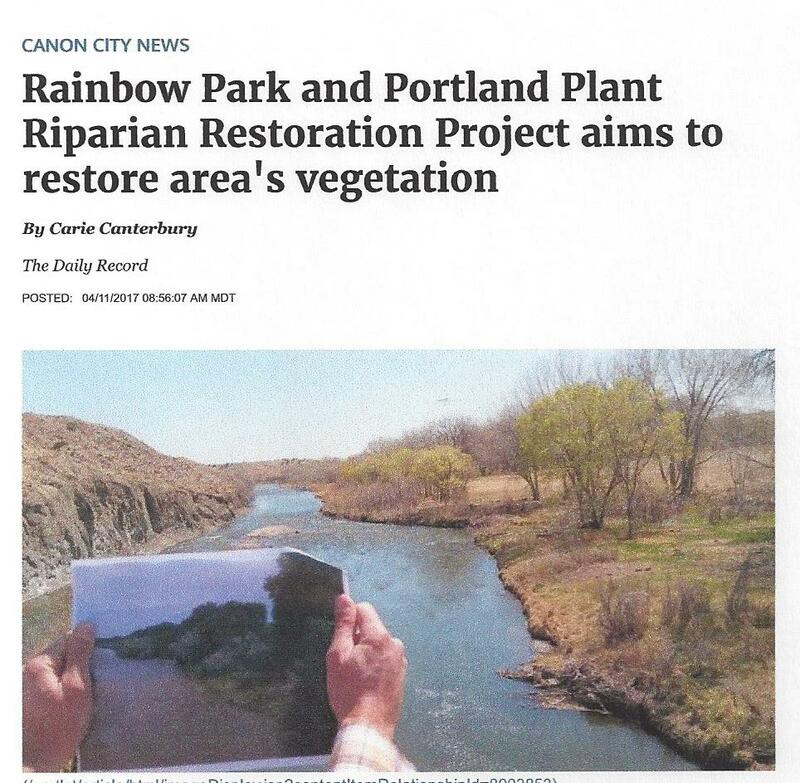 This event was successful at increasing education and awareness regarding invasive plant species, and ways to reduce the risk of spreading noxious weeds. Future work should continue to target and educated constituents, homeowners, and the gardening community! UACWMA thanks Patty Knupp for bringing this event to our attention. 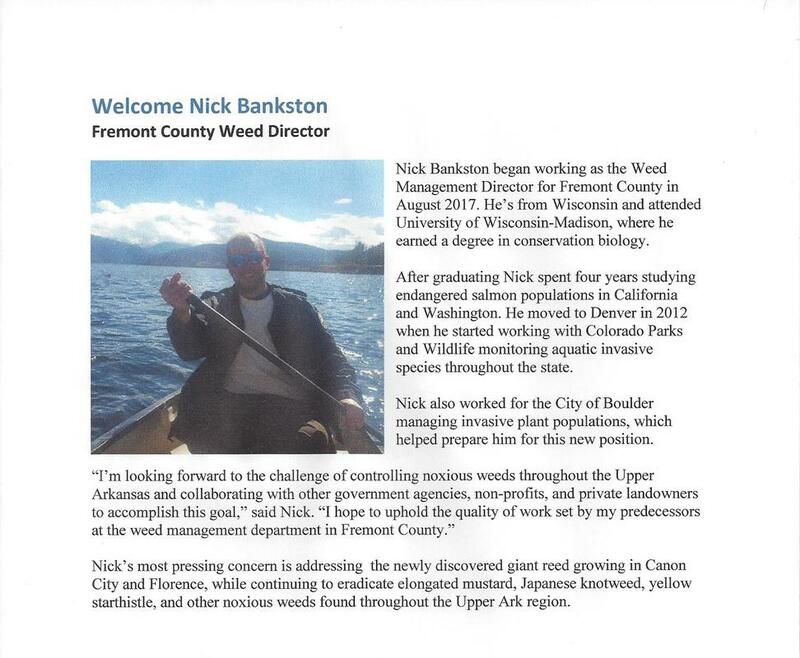 Do you have upcoming events and feel that noxious weed education can enhance it? If so, please let us know, and we would be happy to provide additional resources for your community. 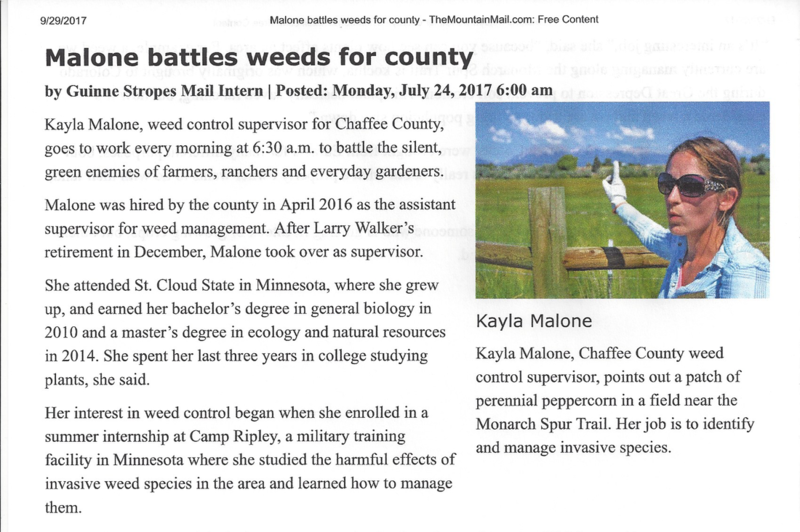 Kayla Malone, Chaffee County Noxious Weed Program Supervisor, was elected to the Board of Directors for the North American Invasive Species Management Association this past year, and was featured in their newsletter, as well as a write up on Fire Ecology. Check it out! The Purgatoire Watershed Weed Management Collaborative recently hosted a weed workshop focusing on noxious weed management and land restoration in Las Animas county.. The CWMA newsletter recently featured El Paso "Happy Parks, Happy People" effort to purge myrtle spurge from a trail in Ute Pass. Click here to read about how Teller-Park Conservation District is working to eradicate Orange Hawkweed​--a List A noxious weed--in the City of Victor. Fremont County Master Gardeners also hosted a station. Sixteen agency personnel were on staff to assist landowners. Nine lucky landowners were recipients of door prizes including a hand sprayer from Ace Hardware, four thermoses from Tractor Supply, and four $5 gift cards from Big R. Thank you to these generous donors! Mary Menz, Teller-Park Conservation District, with the remains of last year's Black Henbane. Carol Kuisle-Franta, Silvercliff Conservation District, speaks with Kayla Malone, Chaffee County weed management specialist, about cooperative weed management in the Upper Arkansas River Cooperative Weed Management area, which comprises eight counties in the watershed. Debbie Mitchell, Fremont Conservation District, greets landowners to the event. Rick Romano, NRCS, talks with a landowner about revegetation and soil health. 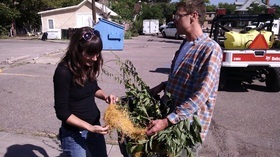 Jana Rapetti, Fremont County weed manager, helps a landowner ID weeds he brought to the event.